Nanotechnology, where the future is! Remember the spine-chilling thriller novel, “Prey” by Michael Crichton that introduced to and terrorized the readers with the swarm of nanoparticles with AI? The prefix “nano” is actually derived from an ancient Greek word “nano” which means dwarf. In its present usage, nanoscience is the study of materials and events at the level of a billionth of a meter, which is equivalent to the width of ten hydrogen atoms laid side by side, or one-thousandth the length of a typical bacterium, or a fifty-thousandth the width of a human hair, or one-millionth the size of a pinhead. 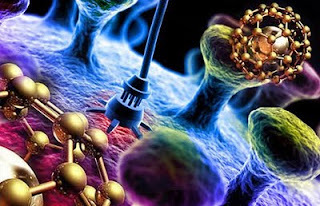 By definition, nanotechnology refers to research and development on structures that have at least one of the dimensions less than 100 nanometers. Nanotechnology is the domain where the sciences: physics, chemistry and biology, meet. Nanotechnology has the potential to create many new materials and devices with wide-ranging applications, such as in medicine and newer diagnostics. Click here to view a presentation on “Nanotechnology in Clinical Diagnostics” and here for “Nanotechnology in Diagnostics and Drug Delivery”. For Application of nanotechnology in medical diagnostic, click here.